The issue is weeds aren't just a problem for the landowner where they grow, Bagavathiannan said. They are collectively everyone's problem because they don't recognize property lines, and that is how they must be managed. The team recently published their findings, Considering Weed Management as a Social Dilemma Bridges Individual and Collective Interests, in the journal Nature Plants. The paper, they say, is a call to action for scholars and practitioners to broaden their conceptualization and approaches to weed management problems, beginning with evaluating the "public good" characteristics of specific weed management challenges and applying context-specific design principles to realize successful and sustainable weed management. "The public-goods lens highlights the broader social vision required for successful weed management," Graham said. "Public goods like weed management are best achieved with the help of many people living and working across landscapes. We need to make the most of the diverse interests, knowledge and skill sets of those involved in managing weeds." 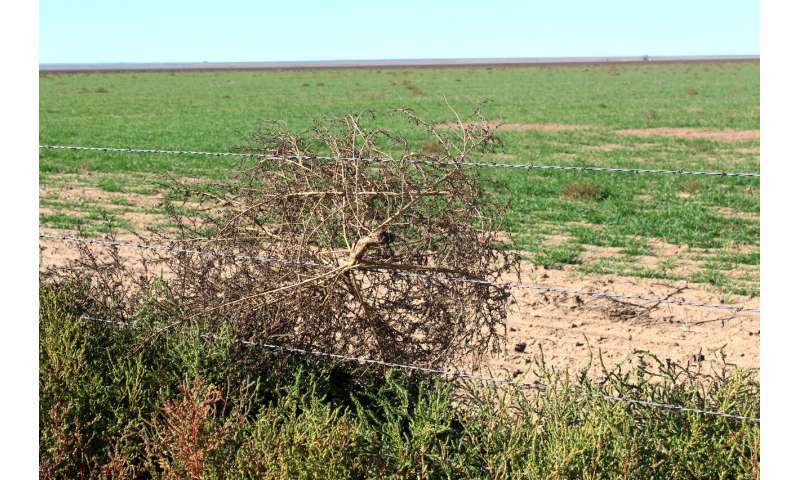 "We suggest that a major limitation of current best management practices is an underappreciation for the complex, multi-scale and collective nature of the weed problem," he said. "We believe practices will be more effective if they are complemented by landscape-scale design principles that encourage cross-boundary coordination and cooperation." - Plant biosecurity—The protection of plant resources from alien pests is a key policy and regulatory tool governments use to limit intentional or accidental spread of weeds, locally and globally. Plant biosecurity includes quarantine, inspection of freight at ports and certified treatment schemes such as bulk fumigation of certain types of cargo. Some governments fail to make these necessary investments to protect global biodiversity. - Weed seed contamination—Weeds, especially those closely related to crops, are common contaminants of crop seeds and can spread through equipment sharing. For example, weedy rice is a noxious weed that threatens global rice production. Due to its propensity for seed shattering and long seed dormancy, weedy rice is an efficient invader that can cause up to 80 percent yield loss in rice and substantially reduce marketable grain quality. - Herbicide susceptibility—Herbicide-resistant weeds are proliferating exponentially, threatening farm productivity and profitability. At least 60 countries have reported herbicide-resistant weeds, including about 500 species-herbicide group combinations. Treating herbicide-resistant weeds costs around $4 billion annually in the U.S. alone. - Weed biological control—Classic weed biological control employs host-specific arthropods or pathogens from a weed's native environment to reduce weed populations in invaded systems. These strategies can have high benefit-to-cost ratios due to long-lasting, low-input costs, and provide management options where other tools are unavailable or impractical. "Achieving such an agreement requires good working relationships, or at least shared values, where contributors are willing to transparently demonstrate their efforts and contribute shared resources to help those who are least able to contribute," he said. "These principles emphasize the importance of recognizing the cross-boundary nature of different weed management challenges and embracing the appropriate cross-boundary solutions," said contributor Dr. Alexander Metcalf, a professor of human dimensions at the University of Montana. One can only successfully fight geometric progression with geometric progression. If one had one dollar and earned 2 percent interest on it for 2000 years, one would have over one million trillion dollars. Biological life grows much faster than this given a chance. That is why they call it the balance of nature. One must find natural enemies to invasive species. This creates the balance. This is why there are 10 of millions of species, for balance. Herbicides and Pesticides could never do the job adequately.